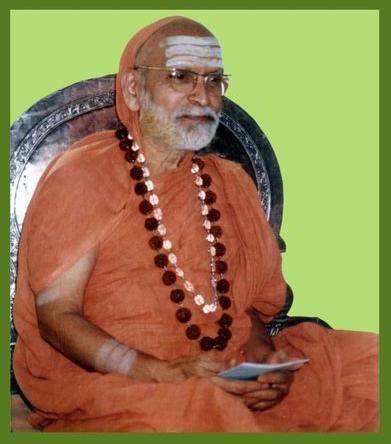 Here is a dialogue between the 35th Sringeri AchAryA, Jagadguru Sri Abhinava VidyAteertha MahAswAmin and a disciple, on the subject of Guru (a teacher of Self-Knowledge). This is excerpted from the book “Exalting Elucidations”, which is a collection of conversations, discourses, and incidents related to the Jagadguru on various topics including Dharma, Karma, Yoga, Jnaana, etc. Disciple : Is Guru necessary for one who desires moksha (liberation)? D: What is the chief characteristic of a Guru? A: A Guru should be a jnAnin (one who has realised the Truth). Further he should be interested in the well-being of his disciple. D: Nowadays, many pose as sages. Such being the case, how is one to identify a real Guru? A: No specific rules exist regarding this. If we are very sincere, Ishwara Himself will lead us to a Guru. We can see for ourselves whether the person whom we wish to have as a Guru is a jnAnin and desires our well-being. Thought it is difficult to conclude whether one is a jnAnin or not, we can use the description of a jnAnin contained in the BhagavadgitA as a yardstick. However, while doing this, it should be remembered that the description was not given to select jnAnins. D: What should be the attitude of the disciple towards his Guru? (Salutation to Him who is manifest variously as Ishwara, Guru and Atman). The disciple should always follow the instructions of his Guru. Even if others opine otherwise, he should treat his Guru’s commands as final. D: Can one who has not attained jnAna bestow the knowledge of the Atman on another? (One cannot comprehend the Atman even by deep enquiry if one is taught by a person who has not realised the Atman. When taught by the teacher who is a jnAnin, one attains liberation). D: is it wrong on the part of a spiritual aspirant to listen to others commenting adversely on his Guru or Ishwara? D: What should he do in such a situation? A: If the man who criticises is amenable to reason, he may be asked not to criticise. If not, the disciple should leave his presence. D: What may a person desirous of going to a Guru and leading a spiritual life do prior to the attainment of a Guru? A: If Upanayana has been performed, he can do gAyatri japa to the extent possible. He can also worship Ishwara mentally. There is no restriction in doing this. The method of performing such mental worship has been elucidated in the Mrityunjaya-mAnasapUjA-stotra, Shiva-mAnasapUjA-stotra, etc. It is good to develop devotion towards Ishwara by dedicating the fruits of all actions to Him. Firm dispassion should be acquired by means of discrimination. Sincere prayer is potent in enabling one to get a proper Guru. D: At what age should spiritual practices be commenced? A: The earlier we start, the better. Were not PrahlAda and Dhruva young boys when they began their spiritual practices? D: Is the Guru’s upadesha necessary for one interested in material life? A: Is a doctor necessary for one affected by a disease? A: If a man desires pleasure in worldly life, does he get it to the extent he wants? Not at all. Even to attain worldly happiness, would it not be wise to seek guidance? The blessings of a knower of the Truth are extremely potent. Hence, whatever may be the way of life desired, it is advisable to seek the grace and guidance of a saint. D: Though some people wish to carry out the instructions of their Guru, they do not always act accordingly. They also have a wrong idea that they can get happiness through some other means. How are such thoughts to be prevented ? A: Will not a Guru consider the well-being and the difficulties of this disciple? A: The Guru is concerned with our welfare. He knows more than we do. He has understood our difficulties. Since this is so, if he gives us some advice, will it not be for our own good? If the disciple firmly establishes such an idea in his mind, he will act according to his Guru’s instructions. When difficulties arise in following instructions, he should think, “It is good for me to act as per his instructions.” Then, vacillation will cease. D: Some people hesitate to disclose their problems to their Guru. So, when it is difficult to carry out his orders, they get the doubt, “My Guru has given this advice for my own good. But there are certain difficulties in following it. I am of limited capacity. How then am I to act as per his instructions?”. A: Is it not sheer foolishness if a man hides facts about his disease when he goes to a doctor? Therefore we should spell out our difficulties to our Guru without any hesitation. It is our duty. Even if that is not done, as the Guru is a knower of the Truth, his instructions will be only in accordance with the will of Ishwara. This being the case, whatever he says will be appropriate for us. If we do not have the capacity to follow his instructions, even that capacity will be obtained his grace. An ideal disciple will indeed act as per his Guru’s instructions and not give place to the thoughts such as, “Is it possible for me to do as he says? Shall I try something else?” If we follow our Guru’s instructions, it does not mean that we are unintelligent. It only implies that we have surrendered ourselves, for our own good, to a power superior to us. D: Is it possible for even a heinous sinner to progress in spiritual life if he obtains a great Guru’s grace? D: Sometimes, even those who have committed many ill-deeds become the recipients of the blessings of great souls. Certain others are quire moral. Still, they are seen to be deprived of similar blessings. Holy ones are not guilty of favouritism. Why then should such disparity be observed? A: We should infer the cause from the effect. A certain person is morally inferior to another. Yet, it can be seen that he enjoys divine grace to a greater extent. There should be some reason behind this. What could it be? The cause may be analysed thus: “If the present life of the sinner is looked into, no reason can be found. However, enquiry into this birth alone is insufficient as there has been a birth previous to this. There, he might have done very many good deeds. Therefore, he becomes a recipient of divine grace in this birth. Hence, it can be inferred that even though he may not be leading a morally sound life now, as he is receiving a saint’s blessings, he should have acquired punya(merit) in his previous birth itself.” It is wrong to infer that a saint is partial. Nothings remains to be attained by a jivanmukta (one liberated while alive). “I have a liking towards this person. Therefore, I should shower my blessings on him. The other individual is not a favourite of mine. So, I need not bless him” – such notions are not entertained by him. Whether he chooses to bless others or not, he stands to gain nothing, as he has attained what is to be attained. D: If it is only due to merit acquired in the previous birth that one gets divine grace, will not grace become an object “bought” by punya? A: The light of a lamp falls on its surroundings. One may study the shAshtrAs in that light, while another may pay no attention to it and sleep . The great souls are always showering their grace. Each one can derive benefit depending on one’s mentality. If one takes a big vessel to a pond, one can bring a large quantity of water. Just because a small vessel can hold little water, it does not mean that the vessel itself is the limit for the capacity of the pond. Similarly, if a man has acquired merit in his previous birth, he might get the good company of a great soul. However, he may not fully utilise the opportunity. Another one, though not having got the same opportunity may, by exploiting the available chance to the greatest extent possible, soon become the recipient of the grace of a sage. D: If the Guru has blessed his disciple with his pAdukAs, how should the disciple respect them? A: Whatever reverence he has towards his Guru should be there towards the pAdukAs also. Everyday after devoutly prostrating before them, he should place sandal paste and flowers on them. It may seem good to perform abhisheka to them daily. If, however, they be made of wood and if the disciple desires that they be with him for long, he himself can decide how sensible it would be to offer abhisheka daily. If he pays respects to his Guru’s pAdukAs with sincerity or if he prays to them with true devotion, he shall get the fruits of the very same actions done directly in his Guru’s presence. Hence, he should never be careless as regards the pAdukAs. D: If a disciple desires to meditate on the pAdukAs, how should he proceed? A: He can meditate on the Guru’s feet as adorned by the pAdukAs. D: How should a disciple conduct himself in the presence of his Guru? A: He should have a reverential attitude towards him. He should serve him whenever he gets an opportunity. However he should also get his permission before doing so. If any clarification is required, he can ask him when he is not engaged in any activity. He should be very sincere in his studies, always thinking that it is his great fortune to learn from his Guru. He should constantly keep in mind the instructions of his Guru and lead his life accordingly.